Managing the affairs of the Club according to the Rules. Ensuring that the funds of the Club are used to promote & facilitate watersports, to encourage the enjoyment & preservation of Axmouth Harbour, and to provide social & other facilities for members. Ensuring that all surplus income and profits are reinvested in the Club. The Club benefits enormously from the expertise of many members and cannot function without the support of the volunteers who form our Executive Committee. 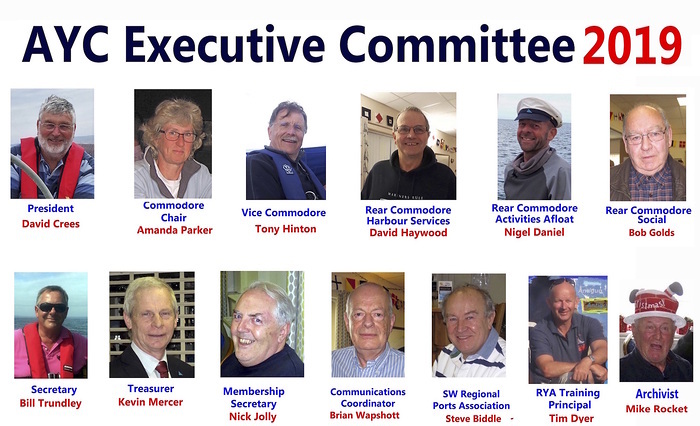 RC Activities Afloat is supported by the Activities afloat sub-committee - includes a secretary and the Chairs of the 4 working groups (racing, cruising, motor-boats & fishing, cadet & family sailing). Liaises closely with RYA Training Principal. RC Harbour Services is supported by the Harbour services sub-committee - includes the beachmaster (oversees maintenance of Club buildings etc), harbour secretary (deals with licensing etc), mooring secretary, representatives from mooring holders (cruisers & motor boats), and the membership/mooring waiting list secretary. Works closely with Seaton Marine Services who provide Bosun services. RC Social is supported by the Social sub-committee. RC Social is always looking for members who can help with catering, advise re entertainment for specific events, or just help with the organisation of events (laying tables, decorating the clubhouse etc). Liaises closely with the Bar Chairman. RYA Training Principal is supported by the Training sub-committee - consists of a Training secretary (manages course bookings etc) and the leads for shore based, powerboat and dinghy RYA training courses. The Bar sub-committee - consists of three members of the Executive Committee, the Commodore and the Secretary. Oversees the roles of Bar Chairman & Bar Manager. The Membership secretary chairs the Membership sub-committee – consists of the president, commodore & secretary who consider any membership issues and refers to the EC as needed. The Communications co-ordinator is supported by the Communications sub-committee – manages website, production of newsletters & yearbooks etc. These sub-committees meet as and when necessary. Each area has a budget, which is agreed by the Executive Committee at the beginning of the financial year (1st October). Decisions made by the sub-committees are reported to the Executive Committee with requests for any additional funding and changes to Club policy as needed. This structure enables as many members as possible to be involved in the day-to-day running of the Club from the grass roots up. Minutes of the Executive Committee meetings and the associated sub-committee reports are available to all members on the Club website - click HERE (only available if you are logged in).